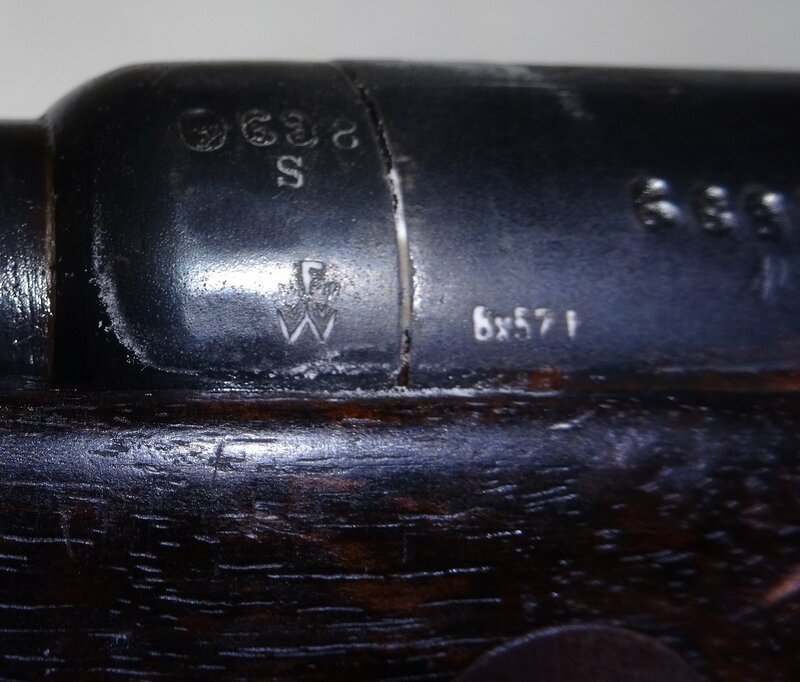 I hope some of the people on the forum can give me some information about this Gewehr88/05. I have six questions. 1. The upper band is stamped "22 R 10 ??" The question marks indicate illegible numbers. All numbers have been crossed out. I am guessing that this means that the band was property of the 22nd Regiment, 10th Company. If this is right, does anybody have a source of information about the 22nd Regiment? I tried to do a web search, and only found information about the 22nd Division. 2. If I am correct that the upper band was with the 22nd Regiment, would that be the first regiment to which it was issued? Could it have been transferred to another regiment before the Great War, and the 22nd rearmed with Gew 98 rifles? 3. The serial numbers on the reciever, barrel, barrel shroud, and magazine/trigger guard match. The bolt serial does not match. 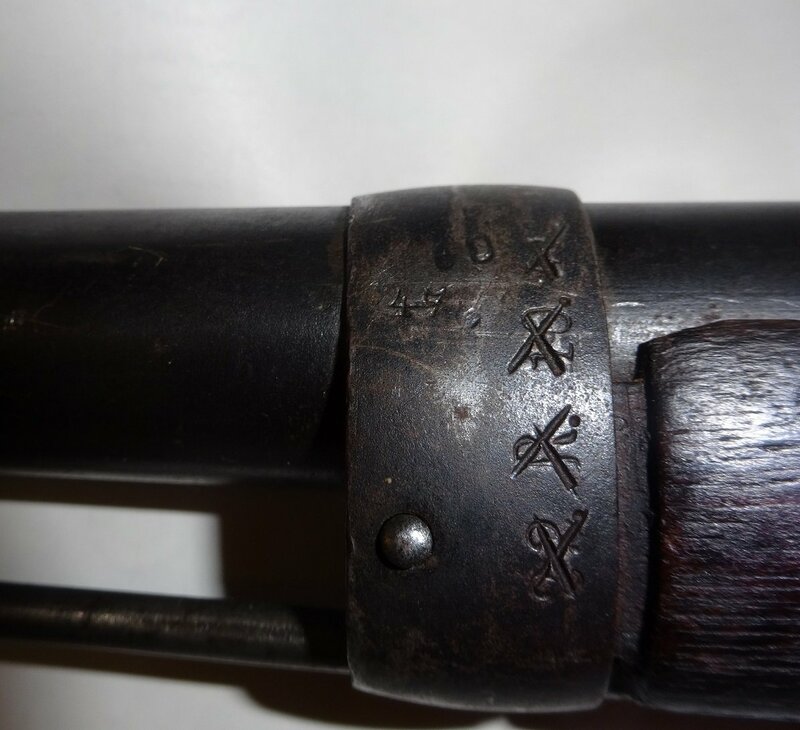 In the opinion of the experts here, is it possible to estimate how likely it is that the barrel band with the 22 R 10 marking is original to the rifle? 4. There is a mark on the barrel shroud that I think are the letters WWF superimposed on each other. At first glance it appears to be a stick figure with arms and legs bent upwards. What is the meaning of this mark? 5. 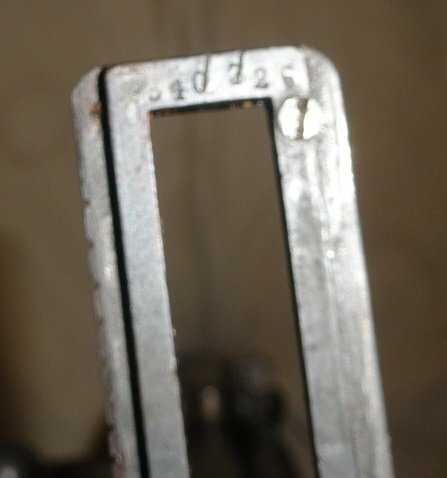 There is a six-digit number on the back of the rear sight. Since all of the serial numbers on the rifle are four digits, I don't think it is a serial number. Does anybody know what it is? 6. I have shot low-pressure Remington ammo in it, and low pressure handloaded ammo. I never intend to shoot any high pressure surplus or European ammo, but I would like to know, for the sake of historical curiosity, if standard military high pressure ammo was used in Gew88 rifles during WWI. If high pressure ammo was used in these rifles, is anybody aware of any accidents or problems as a result? ... 1. The upper band is stamped "22 R 10 ??" The question marks indicate illegible numbers. All numbers have been crossed out. I am guessing that this means that the band was property of the 22nd Regiment, 10th Company. If this is right, does anybody have a source of information about the 22nd Regiment? I tried to do a web search, and only found information about the 22nd Division. If the upper band is original to the rifle - and why shouldn't it be? - then yes, 22nd regiment, or if you prefer Infanterie-Regiment Keith (1. Oberschlesisches) Nr.22. There is a German summary at: http://wiki-de.genealogy.net/IR_22 That was the first regiment this was issued to that marked its weapons, and it was presumably withdrawn from service when the regiment was supplied with the Gew.88. BUT, note that several second line and even some first line units were issued with these Gew 88/05 in late 1914 and 1915 when the German army found it short of rifles and bayonets for all the reservists, etc., called up for duty. That's a nice Ersatz - does it fit snugly? teşekkür ederim Trajan! (I was stationed in Erzurum in 1975-76, and I still remember a few Turkish words) I checked out the link you provided, and it is Interesting to know the regiment was from an area no longer part of Germany. The bayonet will fit either a Gew88 or a Gew98. It fits very snug on a 98 rifle, slightly less snug on my Gew88/05. It fits the 88/05 about as tightly as my SMLE bayonet fits the SMLE rifle. Thanks again!